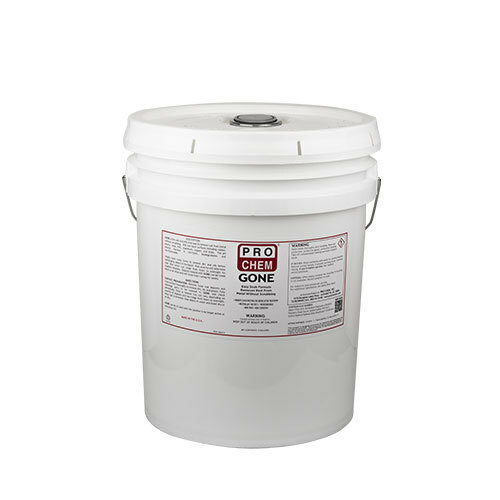 Gone | Pro Chem, Inc.
GONE is a safe, effective way to remove rust from metal without scrubbing. This unique formula will not harm delicate surfaces including rubber, plastic, vinyl, PVC, aluminum, copper and brass. All you have to do is clean the object, soak it in GONE, and the rust will be gone. The pH neutral formula is nontoxic, nonflammable, and biodegradable. Surface Preparation: Remove loose rust deposits and clean surface thoroughly to remove dirt, oil and grease. Fully submerge parts to be cleaned in GONE and check periodically. Time to remove rust can vary depending on the severity of deposits and can range from hours to overnight. Once rust is removed, rinse object in water and towel dry or air dry. GONE can be reused until the solution is no longer active at removing rust.